Speaking My Mind: Mini outing consisting of getting my hair coiffed and a tiny wild shopping spree! Mini outing consisting of getting my hair coiffed and a tiny wild shopping spree! I had a 10:30 A.M. appointment to get my hair cut at Fantastic Sam's for seniors haircut pricing they went up two bucks during the week, Oy Vey, from twelve to now fourteen, still a bargain, hmm? Any-who, my appointment was with Bonney, yep that is how she spells it, who did my hair last time in May on the twentieth. Oh now we all know my memory isn't that great I had found the receipt in my purse. Anyway, my bangs were for the second time in the last month getting into my eyes, so that is why I decided to go today. I did trim my bangs once, but not so easy these days with my right hand hurting so much, and me being a righty. There was a time where I used to cut all the boys hair that is Hubby's and our sons, but these days I wouldn't trust me with the electric hair trimmers! So, I had my haircut and even with the tip still under twenty bucks, two under, and I looked human once again and NOT depressed! Last thing you want to look when you have a doctor's appointment looming. So many of us with chronic ills need to pamper ourselves as often as we can to feel better about ourselves, look good feel good, hmm? Even without illness, feeling good is right for all of us. From there we went over to Tuesday Morning in the same Promenade's Mall, and that's where just looking took a turn for Geez they have some stuff I need and a few items that we just wanted? 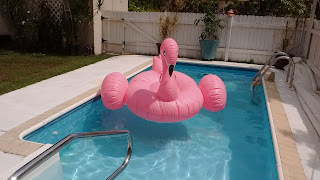 I have in my recent past been somewhat of a collector of old Florida iconic styling... translation Flamingoes, and we do have a small collection to date of nine, we had ten, but one either blew away or was stolen. And so when I saw that the new renewed symbol of this fine water seabird had been turned into an attractive and useful piece of pool accessory and I saw it had gone down in price by twenty bucks Hubby and I decided to add it into our collection as its centerpiece, although only two are displayed daily the other seven sleep in the shed and come out only for special occasions! Here she is the mother of all waterfowls, PRINCESS PINKIE! Quite impressive and rather magnificent I should say! 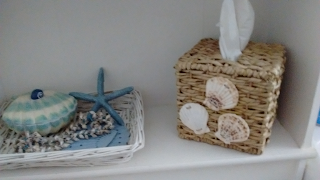 Less in volume but attractive to say the least is our new tissue box, the old one was white wicker and about forty years old, it had fallen into pieces! I like this new one, it prevents the matchy, matchy look I seem to on occasion fall into. Although, the white bathroom does have a seashell theme and this addition maintains that! 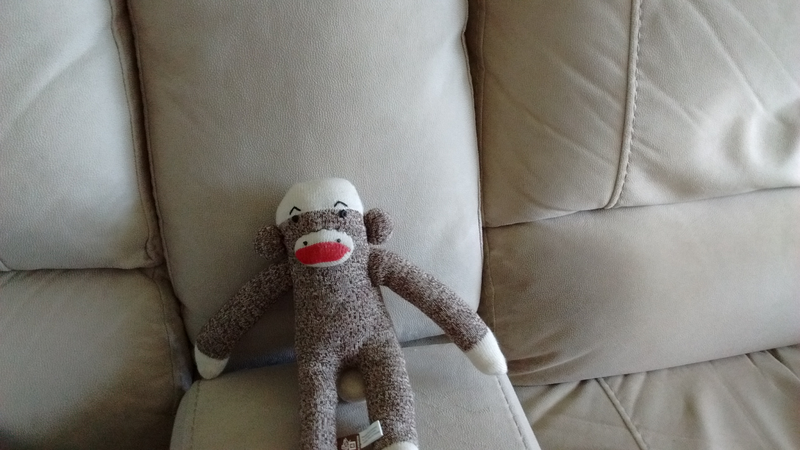 Well second to last is Gus's second Monkey toy, actually his third, but the first is ripped to shreds and hidden I believe in the garage knowing Hubby, he, Gus, loves Monkeys! And he has been a bit of a gloomy Gus these days and so we got him a toy to cheer him up and he does love it! 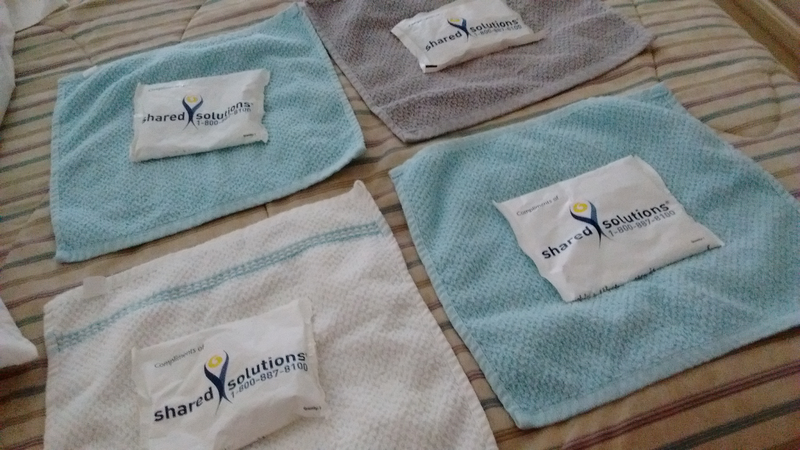 Below are four of the six new washcloths I also went wild in purchasing! As you can see they are the perfect size to harbor the soft ice/heat packs that Shared Solutions from TEVA who makes my Copaxone sends to me as often as I ask for them! I use four lately one on each thigh, yep righty got jealous I think and now is twisting torqueing burning too, one behind the neck for headaches and keeping me cool even inside with the air on and the paddle fan above me, and the fourth for my right hand once I stop typing here. The lower picture is the ice packs closed into the washcloths, my previous ones were not uniform in size that some were too big and some were too small or holey needing to be tossed! Now these are just right, six for $4.99. 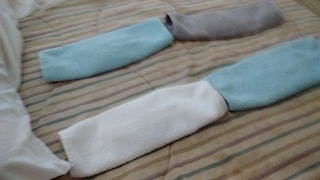 ( I washed them all before I used them.) same price as Monkey, and the tissue box was $6.99, and our biggest purchase, super Flamingo Princess Pinkie Gal was $29.99, all others priced her at $49.99, so she was on sale! 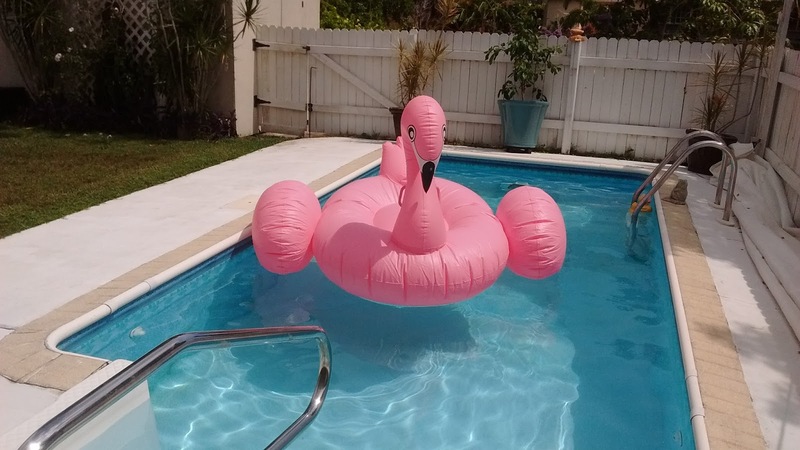 She is a float with handles on either side of her neck, so as soon as I get the okay I will be trying her out! Otherwise, she is a nice decorative touch to our backyard display, okey dokey? After Tuesday Morning's we went over to Winn Dixie in the same shopping center and picked up some vitamins and pretzels, yup that was it, odd items but yeah that was all from there. On this note allow me to wish all of you a very happy good night and ask you all to kindly share all those blessings and we will too!